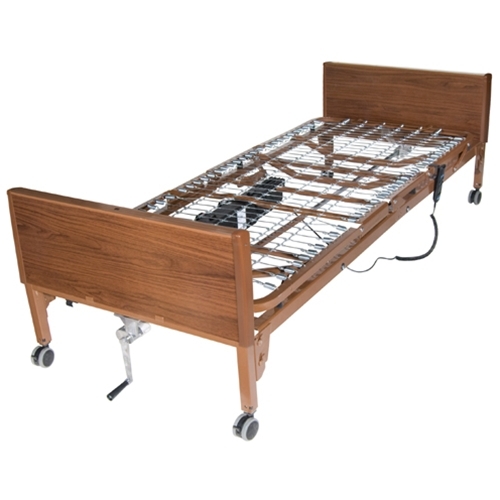 Delta Semi Electric Ultra Light Plus Hospital Bed from HealthyKin.com is lightweight, interchangeable and easily assembled. Its new universal style head and foot boards are interchangeable, featuring high impact composite end panels. The foot section weighs 50 percent less than conventional foot sections. Bed assembly requires only five components. Even motor assembly can be either installed or removed tool free with the patient still in the bed. The unique single motor and junction box are self-contained to reduce noise and prevent disruptions or distractions. Even in the event of a power failure, a 9-volt battery, located in the motor, can lower the head and foot sections up to nine times, no crank necessary. A new-and-improved hand pendant includes large, easy-to-use controls. The bed, which weighs just 150 pounds, features channel frame construction with zinc coated spring deck to provide superior strength and reduced weight. The original purchaser is protected by a lifetime warranty on welds, 5 years on frame and 1 year on other parts and components. Bed weighs less than 150 lbs.